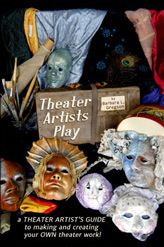 "Theater Artsists Play" is available now!! NEW - Newsletter! 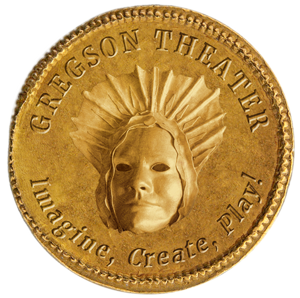 Gregson Theater Podcast and Performance news! Sign up for our monthly newsletter to keep you informed of all of our events, shows, workshops and podcast episodes. Starting April 30, 2019. Subscribe today! NEW - Podcast! “Artists Lost and Found” - Stories, legends and interviews about artists who “create against all odds.” Topics cover our ancient artists pasts to the working artists of today. Tune in soon to our biweekly podcast online, by April 30, 2019. Produced by Gregson Theater and Eric Porter, sound engineer and musician. The podcast is hosted by Barbara Gregson and recorded in our studio in beautiful Chenango County, NY. Theater Residencies for 2019 - Our theme this year is for several of our theater residencies is “Peace” and how different cultures resolve conflicts peacefully. "Peace Tales from Around the World" is the title of the theater residency, which we will be directing at the West Learning Center, BOCES, Apalachin, NY.This is our 4th year working at the West Learning Center with youth grades 2-8. We are happy to be back and proud to have received all of our funding requests from the Arts Council of The Southern Finger Lakes, Corning, NY (www.earts.org). Thank you for the grant award Arts Council and the Apalachin Lions Club for sponsoring us! We will be working at West Learning Center from March 5th - May 10th with two student performances May 9 and 10, 2019. At The Place - We have 2 “Artist in the Community” grant awards pending currently from the Chenango Arts Council,Norwich NY. www.chenangoarts.org) but expect to be at “The Place, Norwich NY, (3rd year), creating a show during their summer program with the theme being, “Peace” scheduled from May-Aug 2, 2019. Our show dates are Aug 1st at The Place and Aug 2nd at the Guernsey Memorial Library. 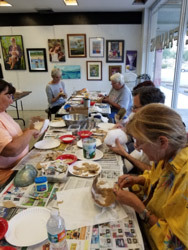 Mask making - Barbara Gregson will be teaching a mask making workshop "Unmask your Creative Self" back for the 4th year at the Easel Arts Supply Store in Lake Park, Florida, April 12-13 2019. Go to the Easel Arts Facebook (March 27th post) for more info or call 561‑844‑3111. Sign up now as it will fill up soon. Last year we had a full class within a week of announcing it. Theater Residency: The Place, Norwich, NY - Youth ages 6-15 wrote an original new production. Workshop: “Theater Artists Play” - This theater making workshop was held twice - Friday, Sept 14th and Sunday, Sept 16th, as part of the 2018 Philadelphia Fringe Festival. The workshop was based on the book, Theater Artists Play. Both workshops were held at The Gwendolyn Bye Dance Center, 3611 Lancaster Ave, Philadelphia, PA and were open to anyone 12 and up and to all levels of experience. Theater Residency: “Stories of Diversity from the City in the Hills” - Adult members of the United Methodist church, Mt View Wellness Center and Oneonta community members wrote and performed their original shows in Oneonta, NY, May/June 2018. Theater Residency: “Kids Speak” - Children ages 7-14 at The Place, Norwich, NY made masks, wrote poetry and prose for their original show performed outdoors in Norwich, NY and also at The Place in July 2018. Theater Residency: “Immigration Nation” -West Learning Center/ BOCES, Apalachin, NY students in grades 2-8 wrote an original show and performed it on April 2018.